So... I'm a huge Twi-hard... in love with all things Twilight. Celebrating the upcoming release of Eclipse to DVD, I decided to work on something from the movie. I would love to convert her mittens to a crochet pattern, but I just don't have that kind of focus right now. Thus, I made her hat. I looked at every pattern out there, and they all do it a little differently. I decided to try and create a pattern based off of the pictures from the movie. I think I got pretty close, even though the color isn't quite right! R18: (for this round, work all regular dc stitches in back loop only) ch 2, *FPDC, FPDC, dc 9 times* repeat around. Join with slst on top of first FPDC. FO, weave in ends. You got it pretty much dead on! Good job! Can hardly wait to try your pattern! Thanks for sharing! I'm in love with this hat!!! Fantastic job on it! Excited to start trying my hand at making it!!! Wonderful pattern I gonna try right now :D Thanks for posting!! Great job! I think you got it dead on as well. I'm going to try this tonight. My daughter and I are Twi-hard fans as well. She will love it!! The numbers in parentheses, are these the total number of stitches?? I am having a hard time with understanding how many of each stitches. Please help. I am making this right now, and saw your comment. I did figure out that you put one stitch in the whole at the end of the row to finish off the increase. Oh and yes the (#) is the finished number of stitches in that row. At first I thought it was off for one or so but thats how I figured out the increase finishes off at the end. the first part is confusing to me..
you dont connect the Ch3? and you do 12dcs in the first chain of the 3? thats odd to me... i did it and it worked.. i hope i did it right lol thank you for the pattern! I love the pattern, I make hats for several different local charities and will add this hat to my patterns that I frequently use. I did, however, make one small change to the pattern. I added a row of reverse sc (crab stitch) to the edge because I thought it was a little too stretchy. For Round 2 it says "2 FPDC on next dc," does this mean the two are on the same front post? I was very excited to make this hat it was a very easy pattern to follow along. I'm going to make this for my daughter for when we go see Breaking Dawn premiere! i luv ur stuff!!!! follow me please!!! Thanks for the help. I'm almost done with this hat. Love it so far! Mine won't sit flat, and the FPDC are bending to make like a star shape. Did you block yours when you were done? Or should I start over? I made this hat,love it,mine is a dark pink,i added a row before the first backloop stitches,to brinv the first ridge doen a bit to look more like bellas,thank u so much for this pattern i love it!!! Oh my!!! This is so great! 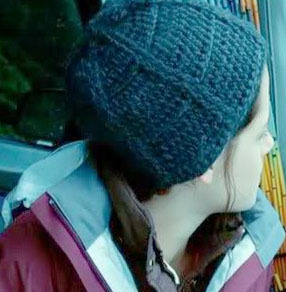 I am a huge Twi-hard and I really wanted to make the hat that Bella wears in the first movie. After I watched the movie a "few" times, I kept checking out the hat she wears at La Push Beach, but I couldn't figure out how to make it. Thank you so much for figuring it out and sharing the pattern! Thanks for the heads up! I put my patterns out free for anyone to use in anyway they see fit. My philosophy is that if I don't give the pattern, people could figure it out anyway (like me) and so I may as well do a service for everyone and let you have it! I'm glad you like the pattern! Wow!!! I am sorry to say this but... when did she wear the hat??? and onto crocheting... what does the pattern stuff mean??? im a newbie and only 11 and I actually thought the pattern was a pattern pattern not words and numbers, etc. I probably passed a billion patterns because it didn't say pattern on there or anything and what do the letter number combos stand for if you could make a key guide for the newbies, I would be so happy and not confused!!! what is the actual color of her hat??? I would LOVE to make it as close as possible!!! thank you for your help!!! When I use your pattern, my hat does't even look close to yours. Please help. if you told me where you are having problems, I would be able to help better. Where are the problems coming from? From the beginning or is there a point where it gets hard? My hat doesn't have ridges like yours does. I believe it's the fpdc that makes the ridges? Are you starting the FPDC on that second round? Yes. I am following your pattern exactly, but I don't have any stitches that stick out like yours. I'm not exactly sure why... perhaps you need to adjust either the yarn, needle or tension that you are using. are you using a really light or heavy yarn? 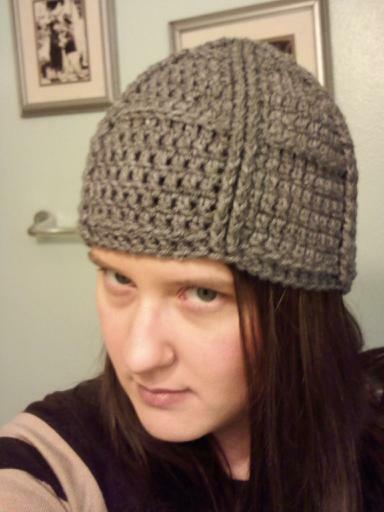 I used regular worsted weight on mine and crocheted fairly tightly. if you are using a light weight yarn and loose stitching or a needle that is too big, your stitches might not pop out. I suggest trying to make a few 4" gauge squares with the FPDC and trying different needle sizes to see if you can get the stitches to pop out. Thanks for the pattern. Turned out great and it was very easy to follow. Added an extra row of fpdc, fpdc, 9dc on each dc around to make the scallop effect on the edge more noticeable. Very quick too, not over 3 hours to make. I just found this pattern and attempted to make this hat but for some reason my ridges came out in a spiral shape instead of straight.. can anyone tell me what I'm doing wrong? I love this pattern! I just have a question. When I start, do I chain 3 and in the stitch closest to the needle do 12 double? Thank you! I just made this hat in black, and it is AMAZING! Thanks so much for sharing. Perfect pattern! !